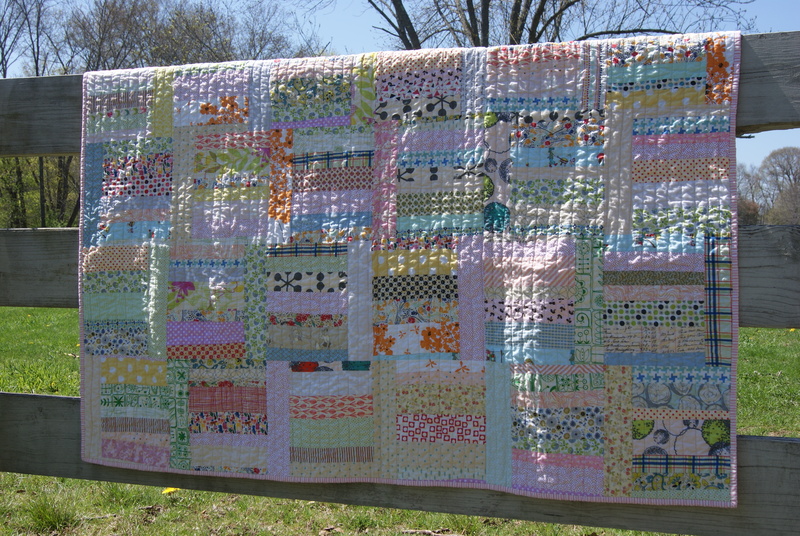 3. i LOVE this quilt! So soft and pretty! This body will be treasured no matter who gets it! 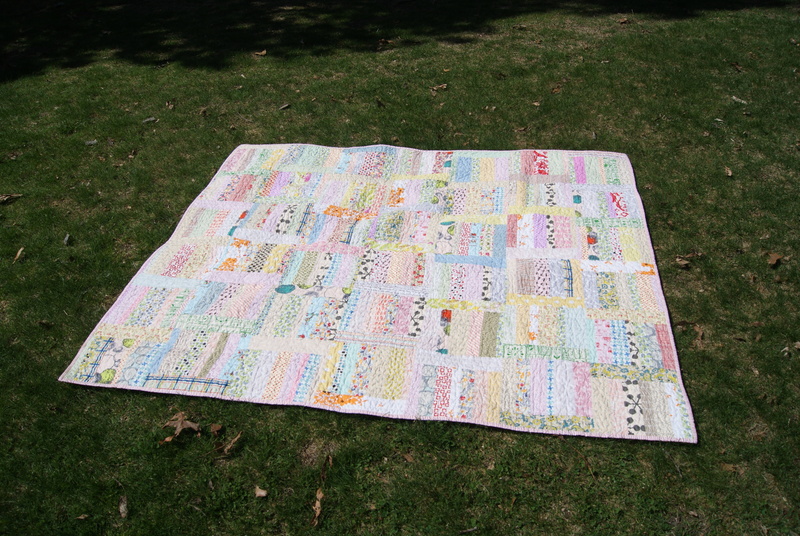 scrappy quilts are the best to give a way or to keep. period. My wedding anniversary is September – I’d love one!! Love it!!! An amazing finish. I love it. I’m working on one of these right now… hoping to finish the top today! I hope it turns out as well as yours did. oh, definitely a special gift! I am in love with that book. and that quilt. and your version of it! so, so, SO fantastic. i’m jealous. but in a happy-for-you way. 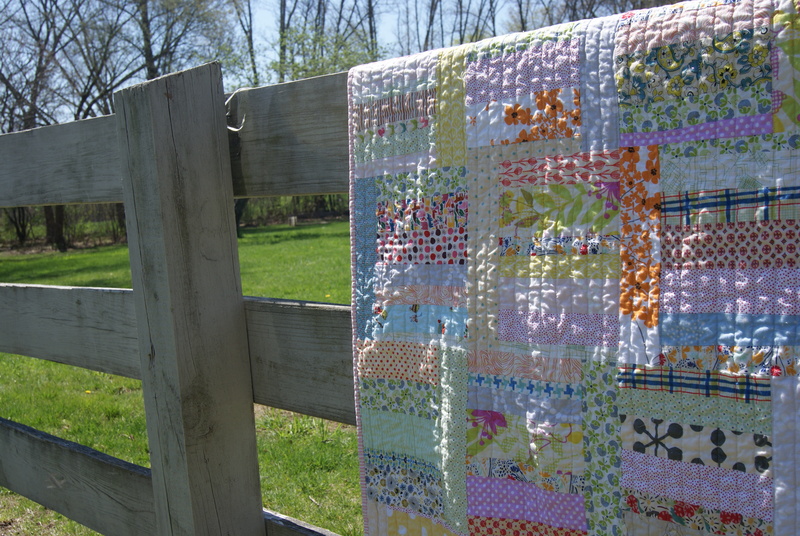 =) i don’t have enough scraps to make one of these yet but am dying to. makes me happy seeing someone else complete one. love the scrappy look but really i think it’s all the low volume pieces i’m loving! Visiting from crazy mum quilts. I love this. It is absolutely gorgeous. 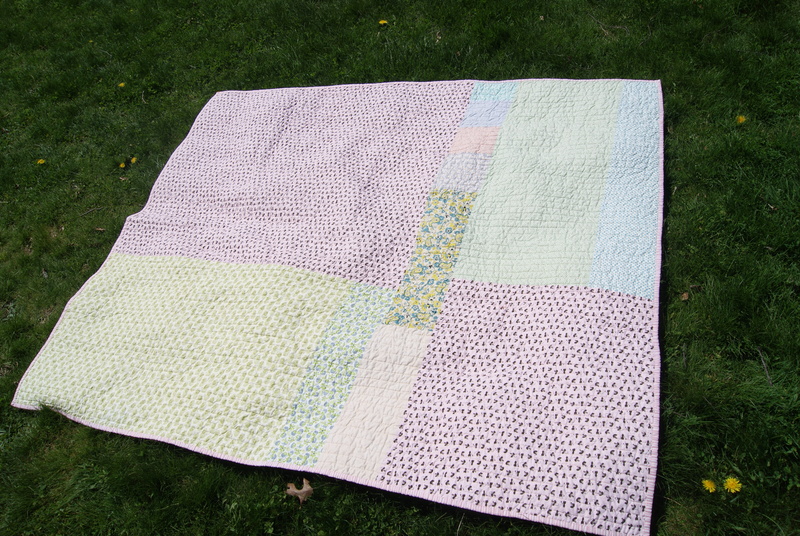 It’s quilt is beautiful and anyone would love to receive it as a gift! And what gorgeous weather (and kid)! 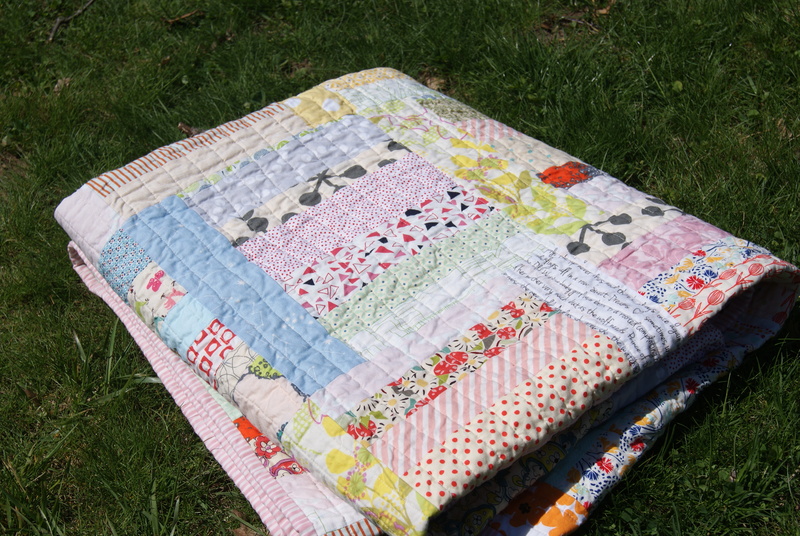 In my mind, scrap quilts ARE the special quilts! Lovely Sunday Morning quilt! The kiddo looks really cute as well. Since buying the Sunday Morning Quilts book I have slowly put aside some fabrics to make this quilt – I don’t quite have enough variation yet, but I’m getting there. Yes I am drooling over this quilt. Love it! Stunning! I’m generally loving the low volume trend, but I love this in particular! It’s got a sort of rosy cheery quality about it! The only way this wouldn’t be a perfect gift is if the recipient wanted to perfectly match their decor or something ocd like that. LOVE this quilt. Very, very sweet vibe to it. I have made a few quilts with this pattern also. I love it for using up scrap strips (of which I always seem to have plenty!). Your quilt is gorgeous! This one is so soft and pretty. Great outside pictures with your little one! Absolutely we gift scrappy quilts! 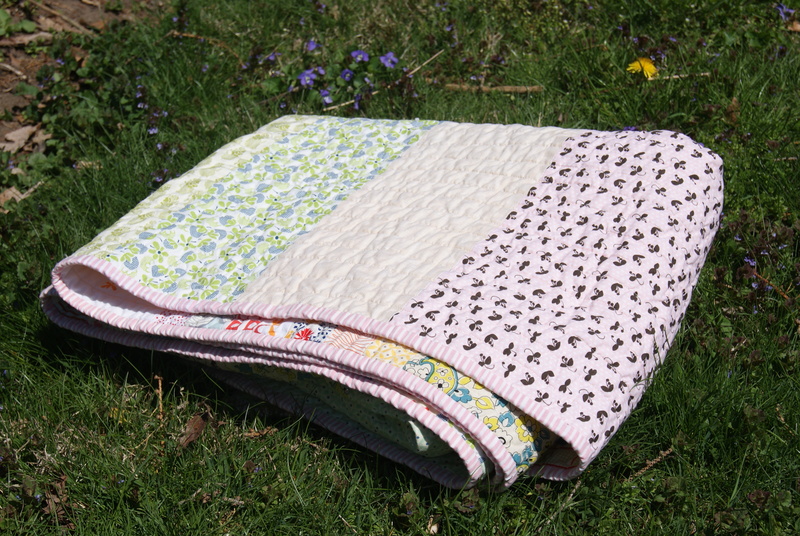 Here’s the rule: those who do not quilt are lucky to get a quilt gift and may not poo-poo any quilt, EVER. 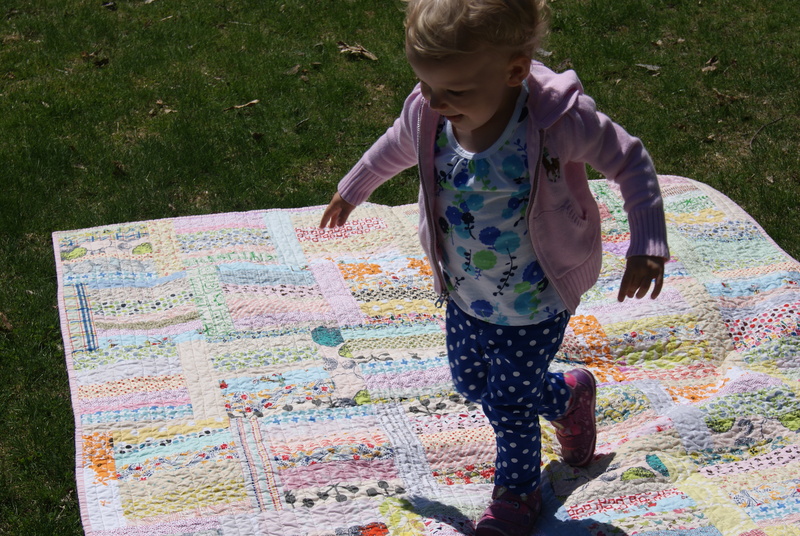 Those of us who make quilts know the work and love that goes into a making such a beauty as this one. Do not fret another moment. It really is beautiful and would make a fabulous wedding gift!